The owner of the Ding a Ling Cafe at 696 Fourth Street is a former Haybaler. And, it shows. Part of her restaurant's decor is a tribute to the mighty fine Balers. My favorites are the tables painted with the block H.
The Ding a Ling Cafe has been a mainstay of Hollister breakfast restaurants for over 50 years. The restaurant has relocated several times since, including a long stay at the Hollister Airport. 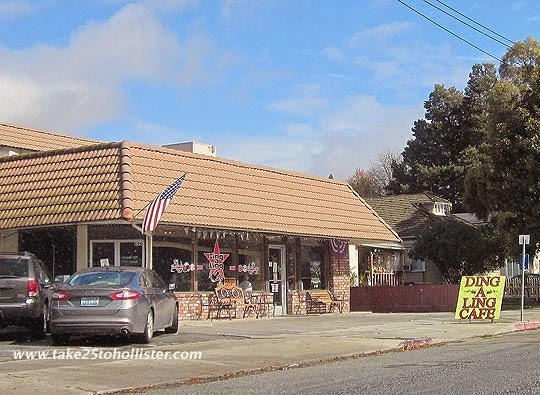 When I was a kid, I remember the restaurant being further east on Fourth Street near Fremont School. I always liked repeating "Ding a Ling" a bunch of time whenever I saw its sign. 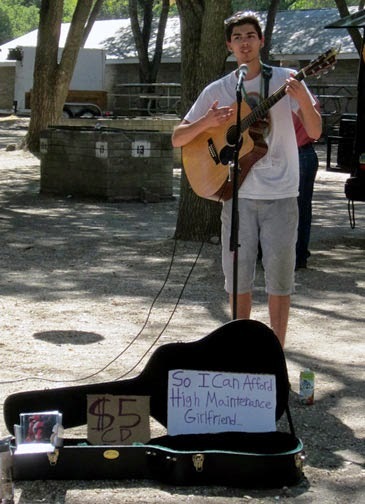 What kid wouldn't, right? Someone once told me that the restaurant got its name from the little bell that hung above the door. The Ding a Ling Cafe is open every day for breakfast and lunch. 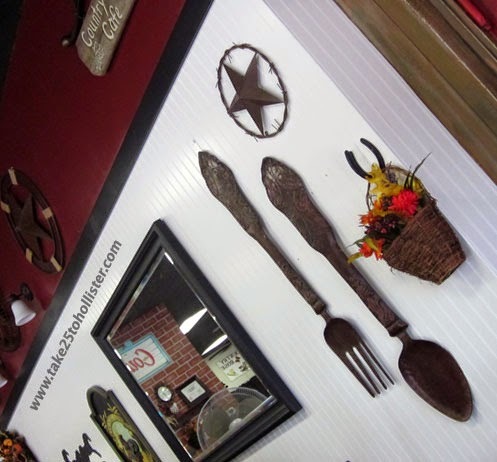 The food is delicious and the portions are generous, including the mini-plates. The service is friendly, prompt, and courteous. 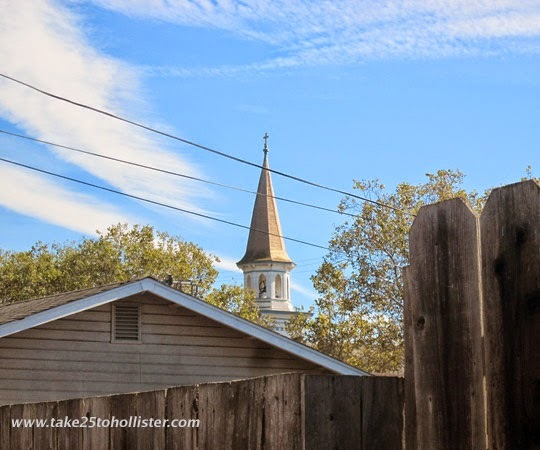 This view of the Sacred Heart Church steeple is from Briggs Alley (near Line Street). I wonder if the church still rings the bells. Anyone know? 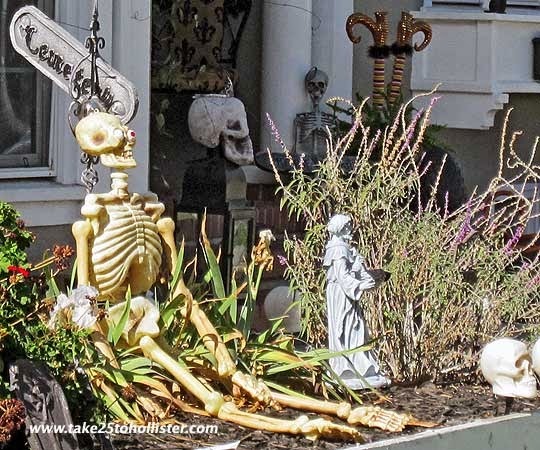 Seeing the Halloween decorations in front yards is making walking a treat lately. 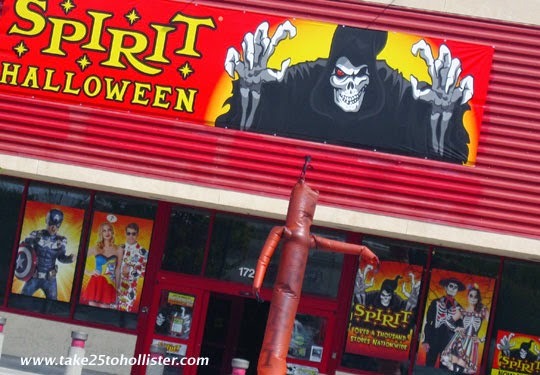 I also enjoy the Halloween decor in some of the shops and businesses around town. I spied the scariest sight the other day when I was driving into my neighborhood. 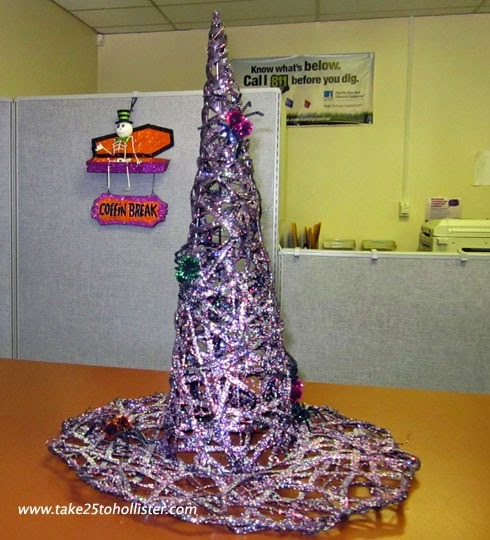 Some folks had already put up their Christmas decorations! Shudder. 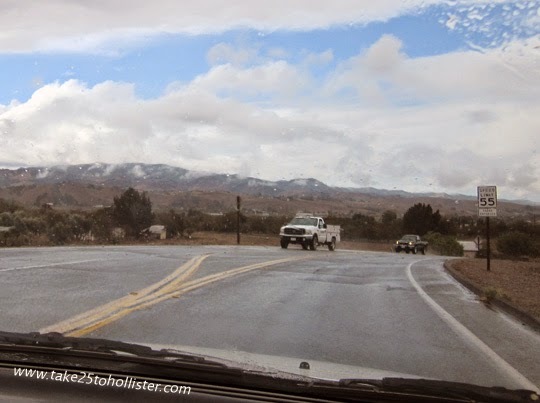 Today, I'm linking up at Our World Tuesday. Come check out what's going on in other parts of the world by clicking here. 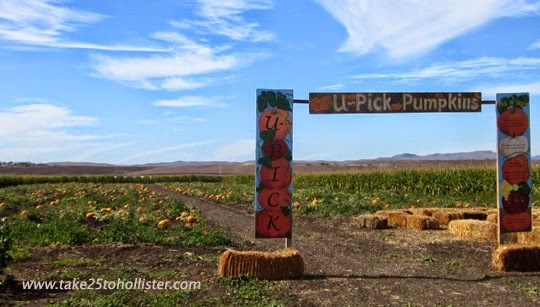 Every October, Swank Farms opens its gates to the public for its annual Corn Maze and Pumpkin Patch. 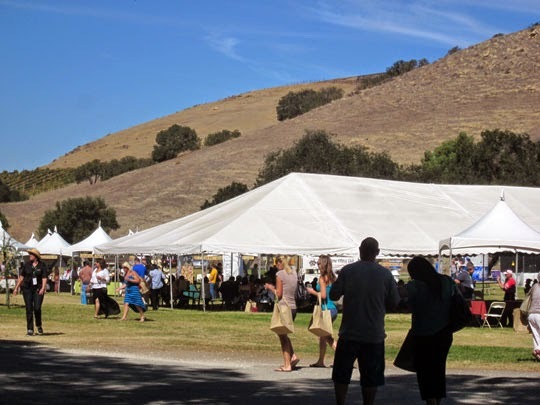 Located on San Felipe Road, just past the north end of the Hollister Airport, the annual event has something for everyone of all ages, from a huge jumping pillow for the tots to a petting corral, pedal karts, pumpkin toss, pig races, pick-your-own pumpkins, and more. The piece de résistance is the Maniac Maze. 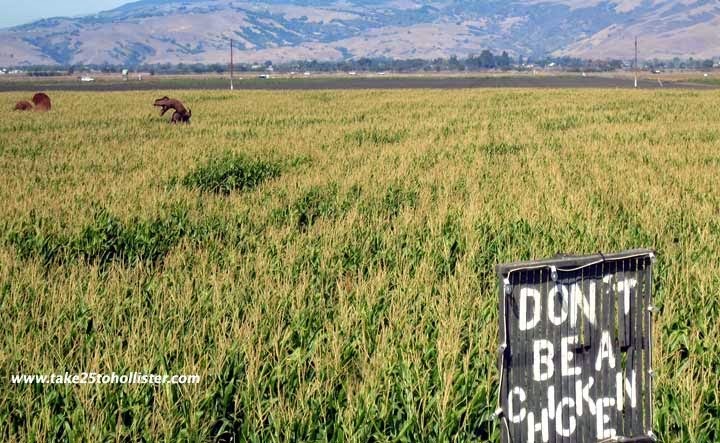 Every year, Bonnie Swank designs a new amazing corn maze to challenge the young and old. This year, the theme is Alien Invasion, which goes along with Swank Farms' spooky haunted Terror in the Corn. The Maniac Maze is open during the day all this week until November 1. If you want to try the maze at night, it's open on Halloween night. It may be also open on Friday and Saturday. Given them a call to make sure -- 831-637-4704. Today, I'm linking up with Monday Mellow Yellows. To see other mellow yellow posts, please click here. See the yellow-tipped spider at the right. Yowza! click here and scroll down to the bottom of the post. The pigs flashed by so quickly, my camera caught nothing but their dust. 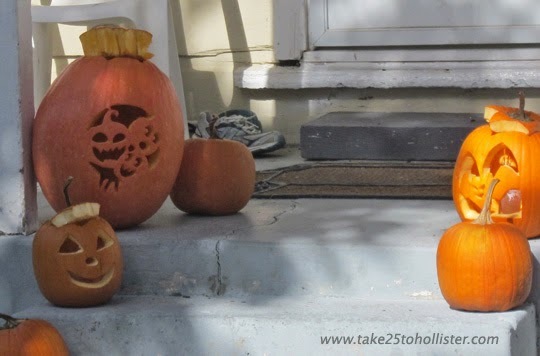 Ornamental gourds. All grown by Swank Farms. This sweetie is part of the Kiddy Corral. It rained yesterday morning. A light rain. But, enough to make the streets wet and to drive about with the windshield wipers on. Because we're in a drought, any amount of rain, however slight, is something for which to be grateful and happy. Weather.com predicts a good chance of rain next Friday and Saturday. Think positively that it will pan out. Peacocks and peahens wander aimlessly around the grounds of Casa de Fruta. 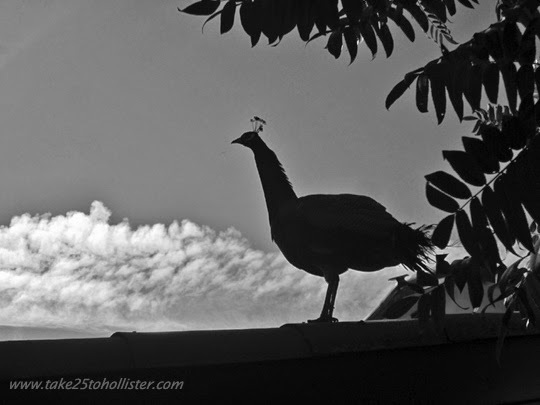 I came across this peahen near the swimming pool of the Casa de Motel, also known as the Peacock Inn. Seriously, these guys and gals are all over Casa de Fruta. They walk through the parking lots. They hang near the pond. They saunter around the exhibits of antique farm machinery. They even stop and watch the kids ride the Casa de Carousel and gaze at folks eating their lunch on the patio of the Casa de Wine. Yes, a visit to Casa de Fruta for me is not complete without an encounter with one of the peafowls. 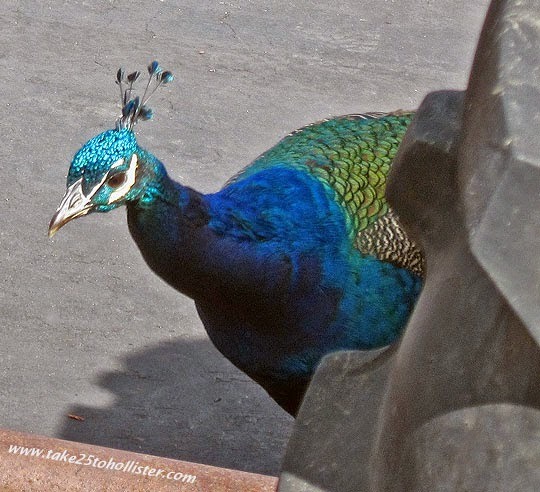 Now, if only one of the peacocks would've strutted about with his feathers in full display. Next time. Today, I'm linking up with The Weekend in Black and White. 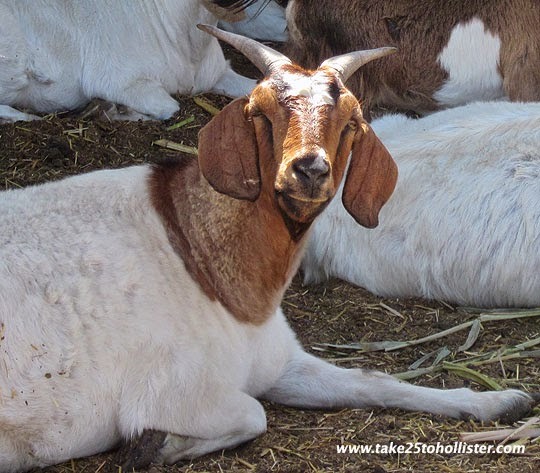 Please click here to see other B&B white photos from around the world. 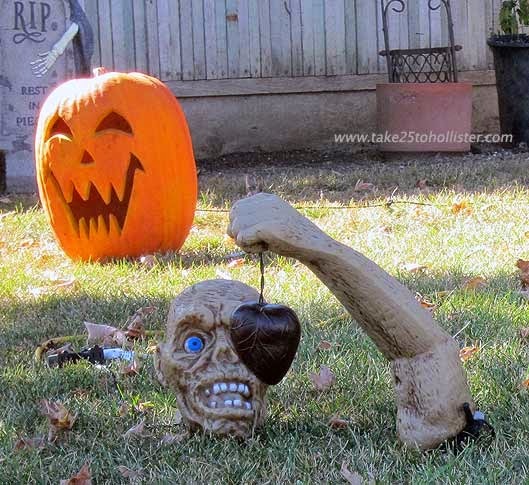 Yes, you can buy your pumpkins at the supermarket. Nothing wrong with that. 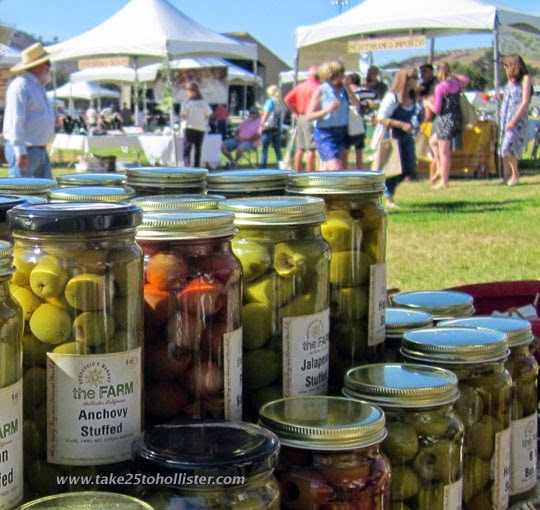 But, if you want a bit more added fun, you might check out one of these local hot spots. 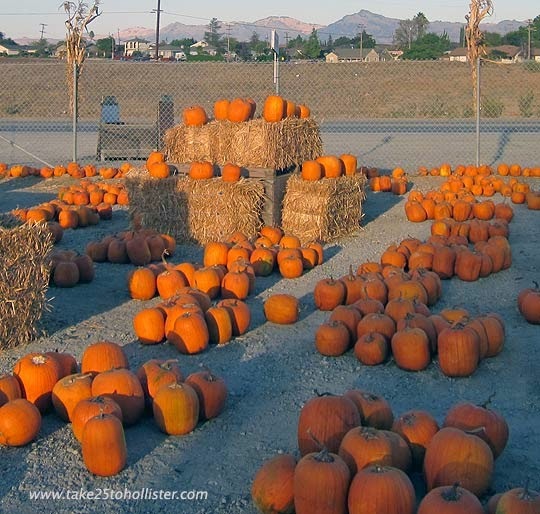 The Tonascia Farms Pumpkin Patch is in the parking lot on the west side of Airline Highway (aka Highway 25) just before you reach Bertuccio's Market–The Farm, near the corner of Union Road. Another reference point for you: Where Maverick's BBQ is set up on Friday afternoons. 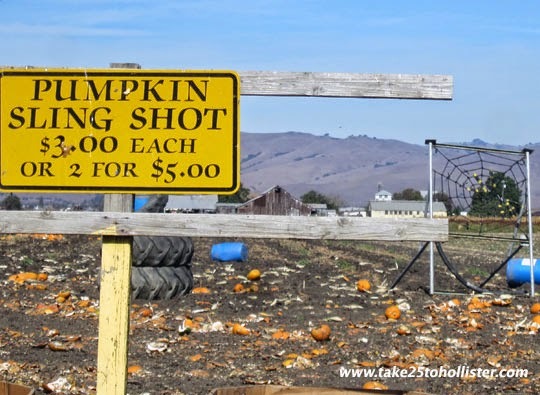 The pumpkin patch is self-pay. 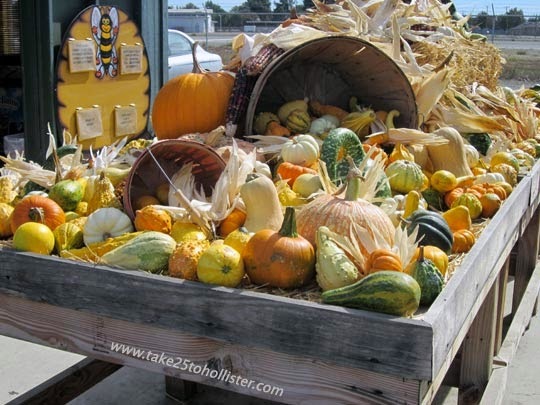 If you'd like to buy gourds, Indian corn, and decorative pumpkins, then head down to Bertuccio's Market. 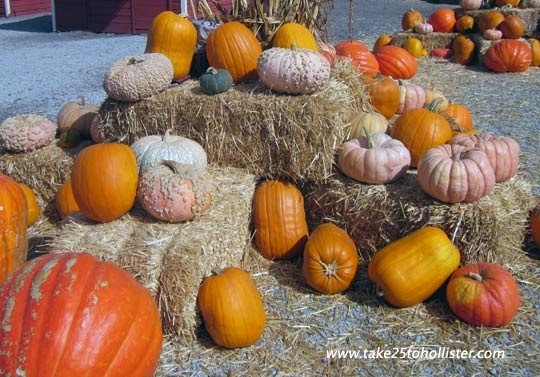 At Swank Farms, you can choose to pick your own pumpkins or buy them ready to go. 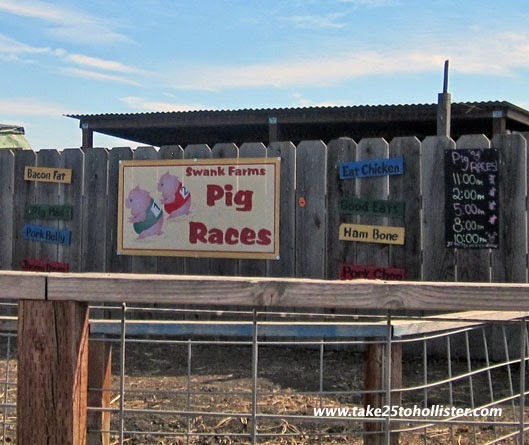 While you're there, you might enjoy some of the other fun activities, besides the corn maze, they offer throughout October, such as the pumpkin sling shot, pedal cars, pig races, and the corn cannon. If you want a good fright, go at night and check out their Terror at Night, Alien Invasion. Mwahahahahaha! 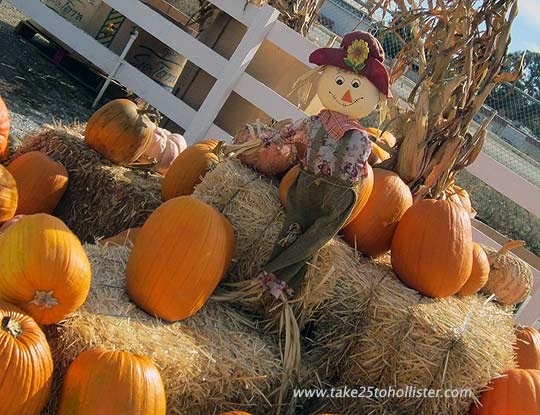 Every October, Casa de Fruta, just a few miles northeast of Hollister, sets up its Pumpkin Junction with pumpkins of all sizes ready to go. 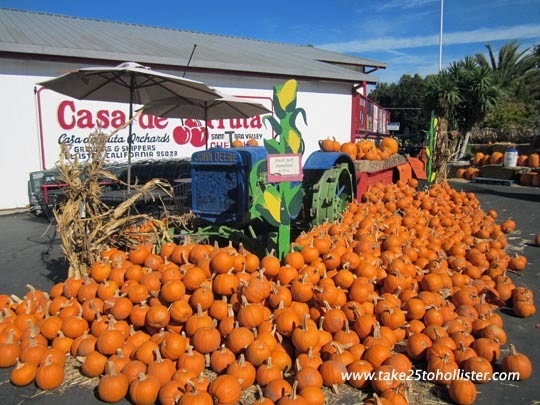 Either before or after choosing your pumpkins, take the time to enjoy the various activities and shops that Casa de Fruta has to offer, including its infamous produce stand, Casa de Choo-choo, Casa de Carousel, wandering peacocks, antique farm machinery, and more. 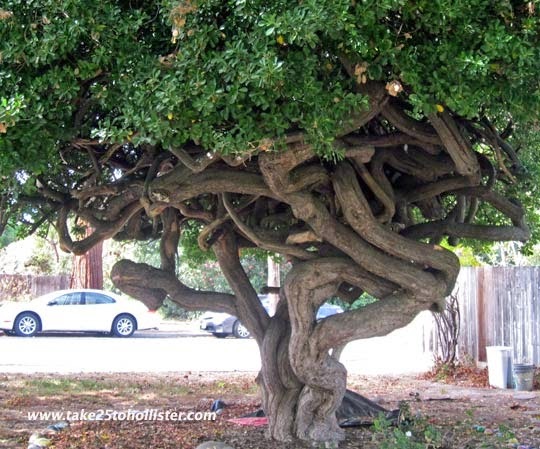 This amazing tree trunk is just one of the wonderful sights to see while walking around the downtown neighborhood. 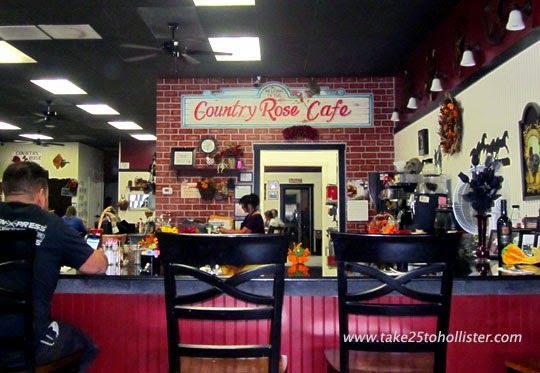 Yesterday, I wrote about my childhood buddy and I eating lunch at the Country Rose Cafe. Today, come with us as we toured the Joshua Inn Bed and Breakfast at 712 West Street, across from Dunne Park. The tour was a sweet happenstance. 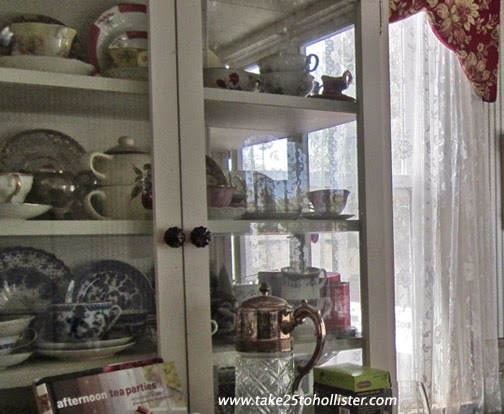 As we approached the B&B, we wondered if we could take a peek inside. Maybe step into the hallway and crane our necks to see into the parlor and the dining area. So, we knocked at the door and what do you know, it was answered by the lovely Trish Harvey, who, with her husband Steve, owns the beautiful inn. Busy as she was, she graciously showed us both the insides and outsides of their beautiful inn. The B&B has five themed rooms. Their names give you an idea of the decor—French Quarters, Pennsylvania Station, Captains Quarters, Savannah Beach, and The Kuschel Suite (which means cuddle in German). 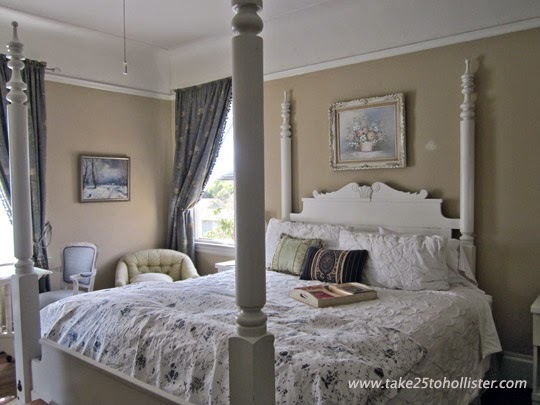 Check out the Joshua Inn's webpage for photos of the cute rooms. Both my buddy and I have been curious about this classic Queen Anne house ever since we were teenagers many years ago. 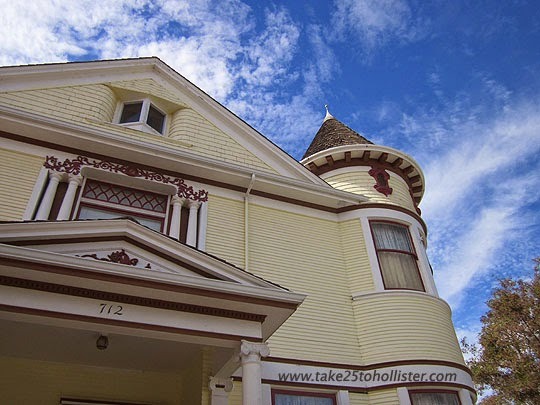 The house was built around 1902 for Judson Hamilton who owned the harness and saddle shop in Hollister. 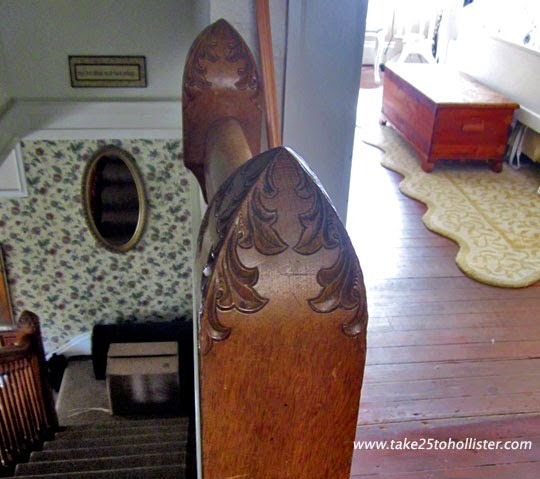 Perhaps the architect designed the newels of the stairs to reflect Hamilton's occupation. 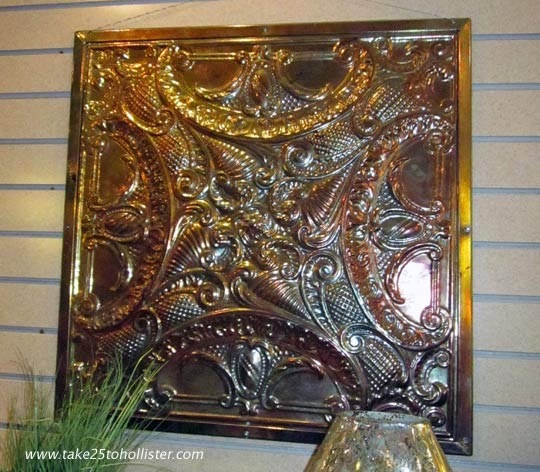 Don't you think the details remind you of a saddle? Every now and then I see photos at the B&B's Facebook page of the yummy breakfasts that they make for guests. Trish says they don't have the proper license to offer breakfasts to the public. Take a look yourself at the photos. Here's the link. Try not to drool too much. Along with being a B&B, the Harveys have space available for meetings, tea parties, family reunions, and other private and business events. 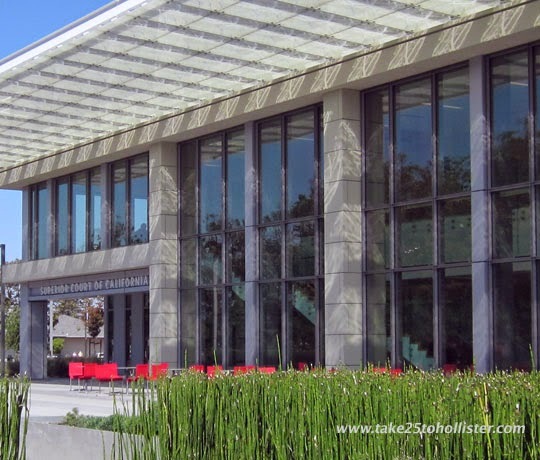 I can imagine an afternoon class reunion there. For more information about the Joshua Inn Bed and Breakfast, check out the Harveys' website. One more photo before I go. 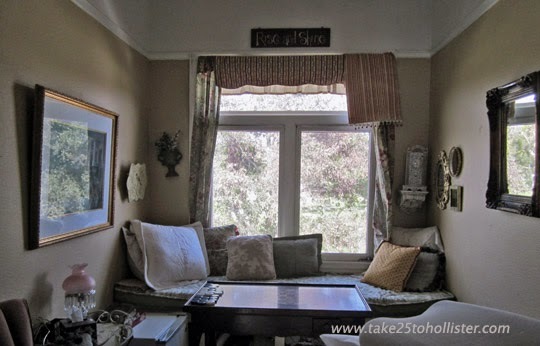 This is one of my favorite spots in the inn—a cozy window seat on the second floor. I hadn't been to the Country Rose Cafe since it moved to its new location on the corner of San Benito and South Streets. Yes, I know, the restaurant has been there for more than a year. In my defense, I've sworn off large portions so I mostly dream about where I'd love to eat breakfast in town. And, I have to say, we are fortunate to have quite a few from which to choose. Anyway last Friday, a childhood buddy came for a visit so we headed downtown for lunch. Because neither of us had a preference, we tossed a coin. My first reaction upon entering Country Rose was how cute it is. It's open, spacious, and festively decorated. A perfectly fun place to hang out and catch up on stuff with a friend. Country Rose still serves an ample plate of breakfast, which my friend had a good time polishing off. My crisp green salad with a bleu cheese dressing was very tasty. And, I liked that our cups of coffee kept being refreshed as much as we wanted. I also liked that there was no sense of having to hurry through our meal. After going out the cute red doors of the Country Rose Cafe, we took a leisurely stroll through the neighborhood, including a stop at the Joshua Inn Bed & Breakfast. Hmmm, I see a theme for this week's posts happening. Stay tuned. 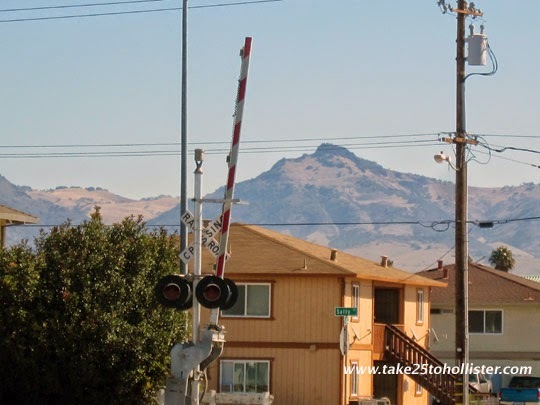 Here's what a weekday afternoon in Downtown Hollister looked like recently. 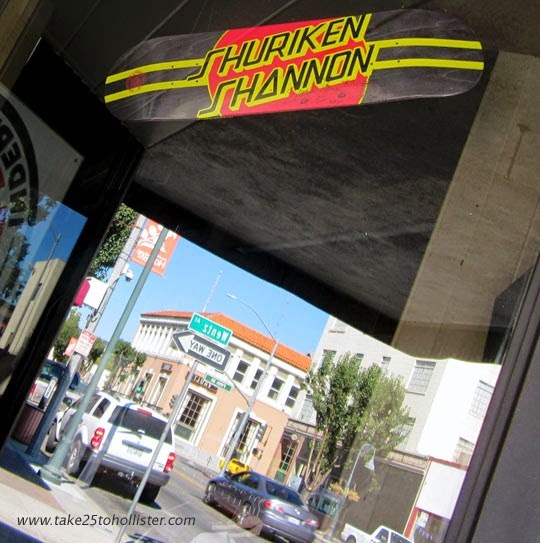 I took this reflection in the window of the recently opened Hooligans Skate Shop at 535 San Benito Street. I'm hanging out at Weekend Reflections today. Click here to join me. 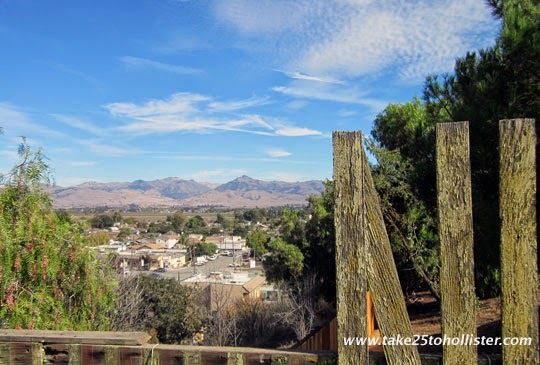 The views are spectacular from Valley View Road. This is the last unobstructed view, which is between Sunset Drive and Union Road. That, too, will be no more as plans go forward to construct a housing development on that expanse of land. On the positive side, the view looking up on Valley View Road is gorgeous no matter what is in the way. Today is Skywatch Friday. 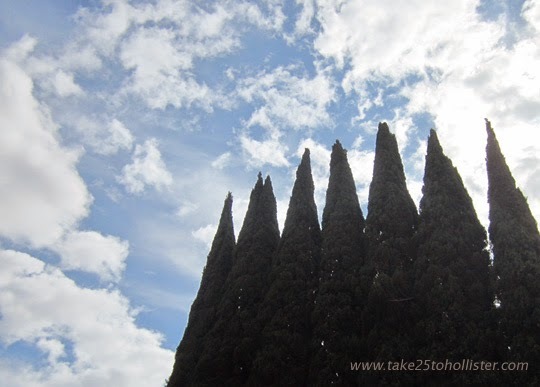 To see what the changing sky is like in other parts of the world, please click here. 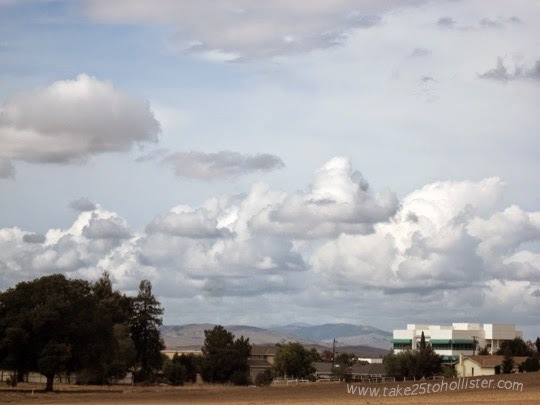 The clouds did their best to gather to give us rain in Hollister yesterday. Hopefully, rain will fall soon. 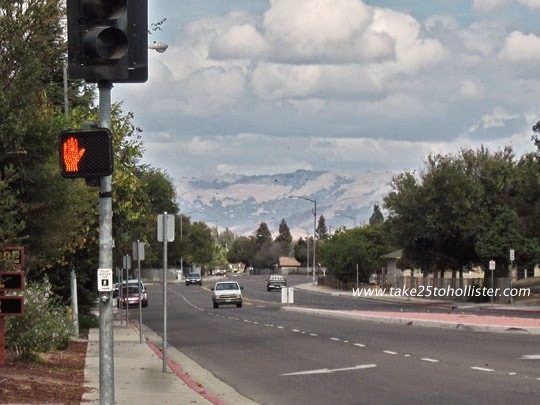 I took this photo at the corner of Sunnyslope and Memorial, looking north on Memorial. We live in a very beautiful area, don't you agree? 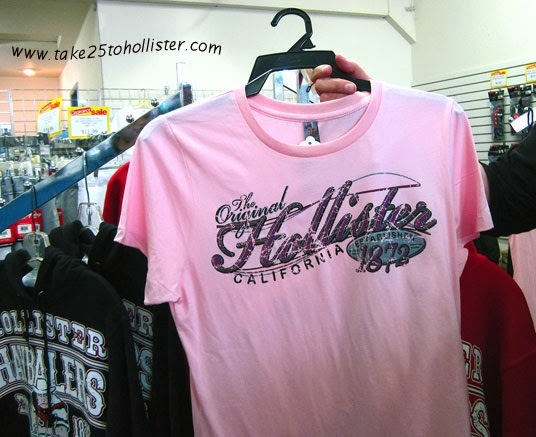 Methinks it's time again to say that Hollister, California, the store, is not the same as Hollister, California, the city. 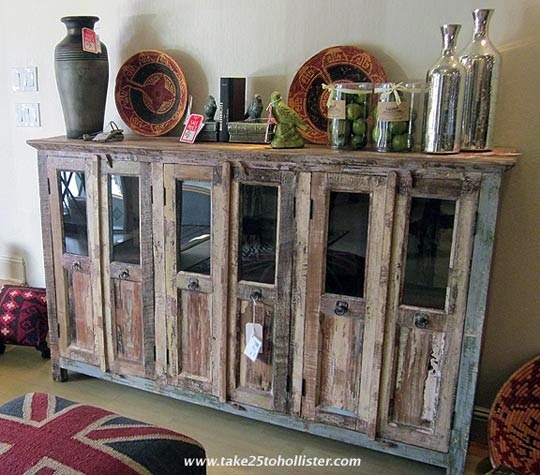 Abercrombie & Fitch began selling apparel with the Hollister brand in 2000, which is weaved around the fictional beach town of Hollister in Southern California where the made-up Hollister Company is located. Either the fantasy town or company was established in 1922 by an imaginary Dutch East Indies immigrant named John Hollister. 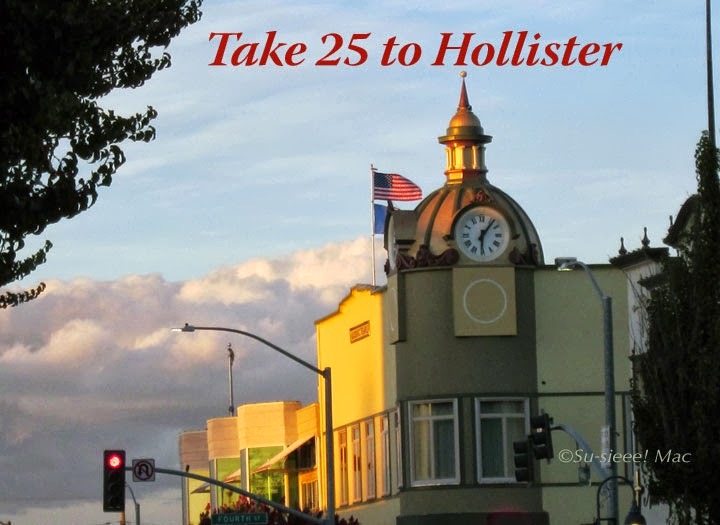 The marketing team must've had fun dreaming up the fanciful, fake Hollister, California story. 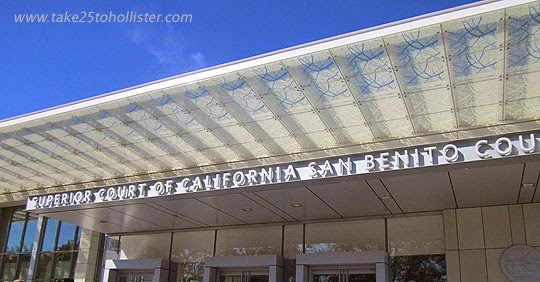 The real city of Hollister is located in San Benito County, the only landlocked county of the Central Coast region of California, which is about 45 miles east of the Pacific Ocean. The ocean breeze, as well as the fog, comes through the low mountain passes on most days. Thank goodness for that, otherwise the temperatures, especially in the summer, would be unbearably hot. 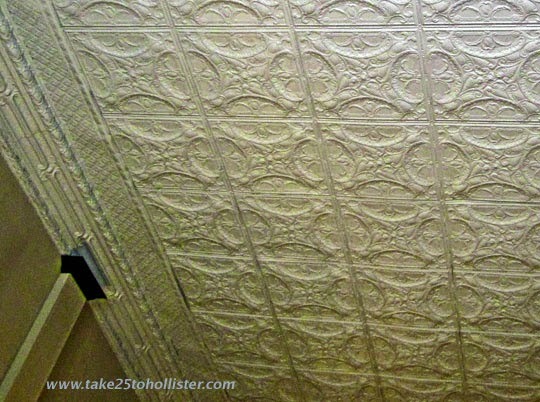 Hollister was founded in 1868 and, until it incorporated as a city in 1872, the town was part of Monterey County. 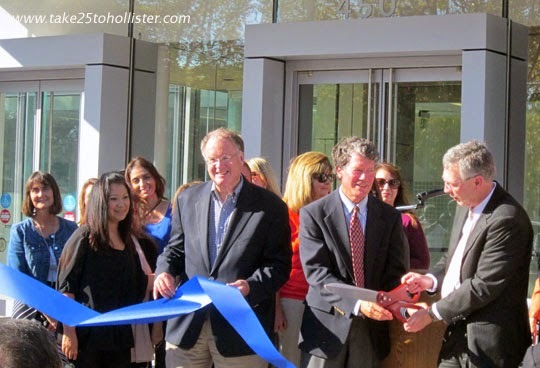 Two years later, Hollister became the county seat of the newly formed San Benito County. The main industry in our county is agriculture. It has been from the start and unless all the ranchers and farmers sell their land to housing developers and oil companies, we shall always be an agricultural community. Something for which we, locals, ought to be proud. The number of local farmers and ranchers choosing to follow sustainable and organic farming practices continues to increase, which I think is good for both our health and the environment. 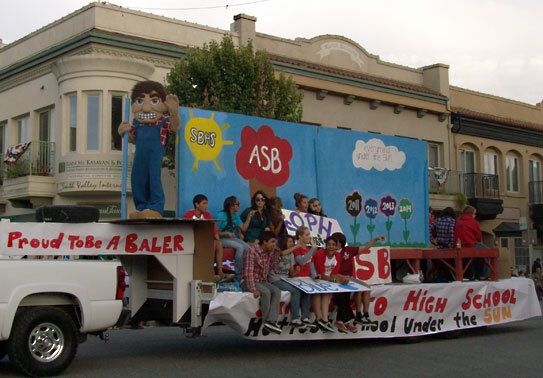 The mascot for our local high school is the Haybaler, also called Baler. Not a machine, but a young farmer. 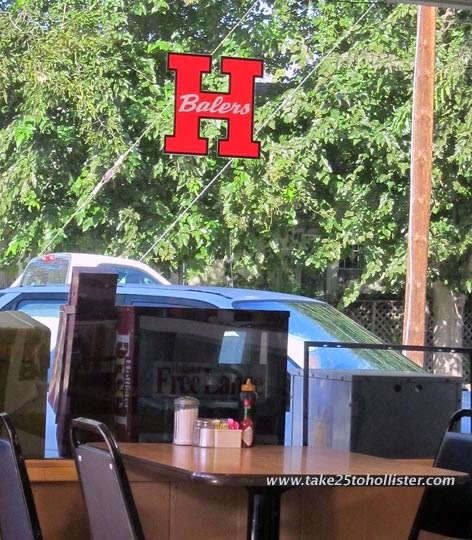 Everyone who goes--and went--to San Benito High School, also known as Hollister High School, is a Haybaler, regardless of whether the person played a sport or not. 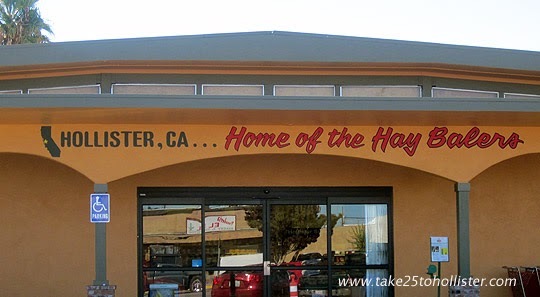 Once a Haybaler, always a Haybaler. I don't know about the history of the mascot, but in the late 19th century, our area was known for the quality and quantity of its Hollister Hay. During the summer of 1892, for example, 5,412 tons of hay was shipped from Hollister to Seattle, San Diego, Chicago, New York, and other parts of the United States. In fact, the Lathrop Hay Company, owned by Hollister pioneer resident Levi B. Lathrop, constructed some of the largest hay warehouses in the world back then. Lathrop built the first hay warehouse to have a railroad track running through it and to have railroad track scales. That's rather impressive. Hey! How did I end up talking about hay? Today is Mrs. Denise Nesbitt's ABC Wednesday. 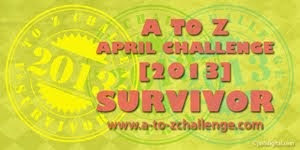 I'll be checking out posts featuring the letter N. Come join me by clicking here. 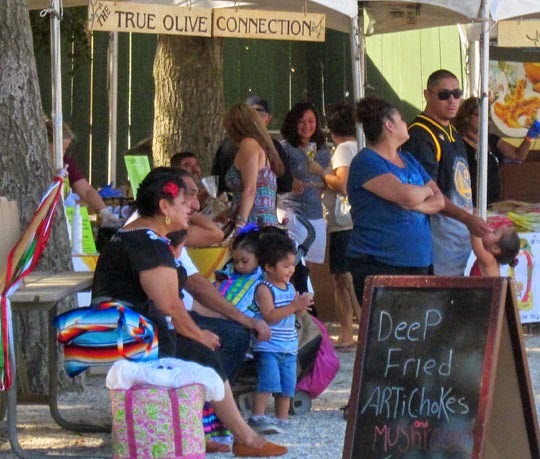 The fog burned off just in time yesterday to make it a gorgeous day for the San Benito Olive Festival. 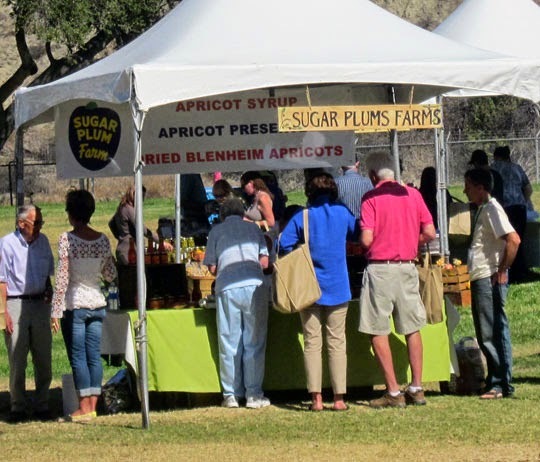 The organizers created a beautiful setting at Bolado Park for the gourmet event that celebrates the rich culinary agriculture of our region. 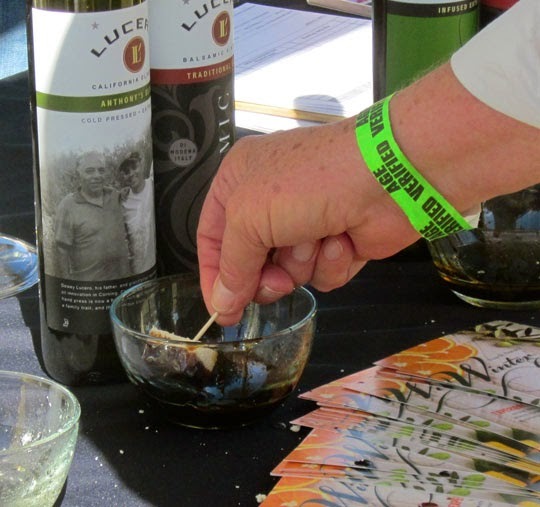 The Husband and I had a fun day sampling artisanal olive oils, chocolates, Blenheim apricot jams, Chipolte tortillas, and more. 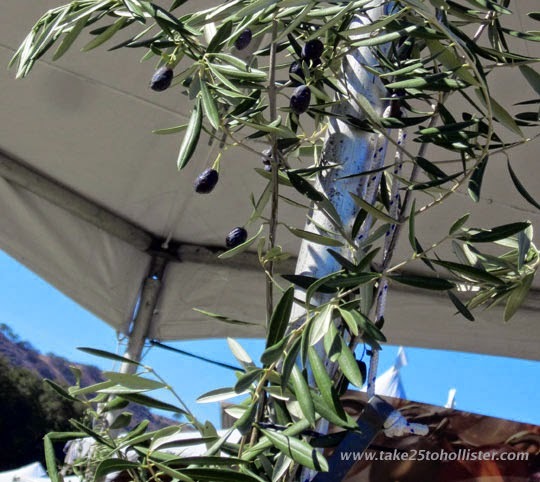 And of, course to taste olives stuffed in garlic, bleu cheese, habanero peppers, and what have you. 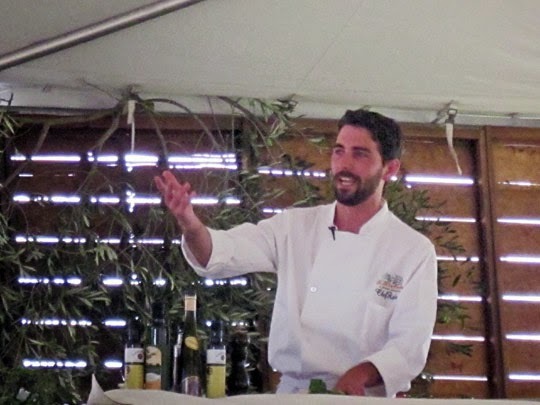 It was fun watching the live cooking demonstrations from celebrity chefs such as Mike Fisher, Sakabozzo, and Dorothy McNett. 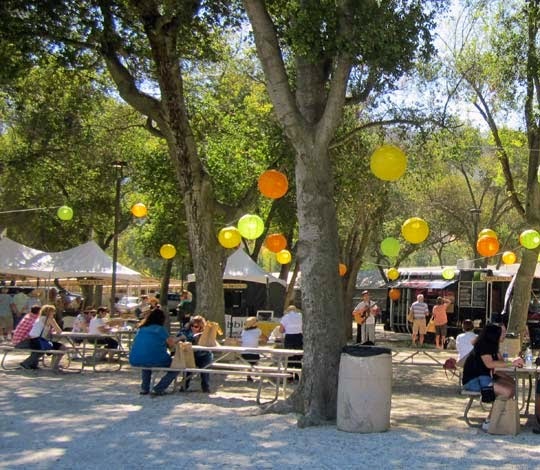 And, to sit under the trees to eat delicious food and drink regional wines and handcraft beer. Lots of good music from local musicians, including Zachary Freitas, Shiloh, The Flashbacks, Retrospect, and Mr. O's Jazz Band. 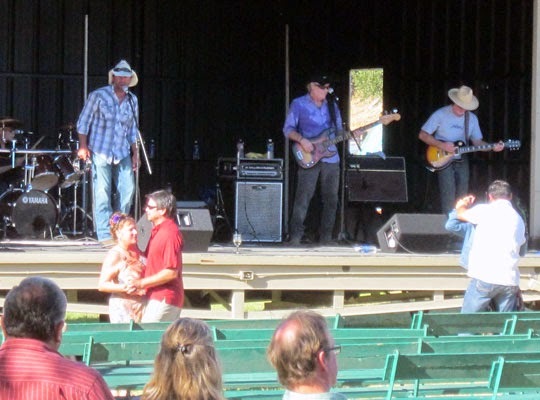 It was fun to sit and listen to them, as well as to get up and dance. 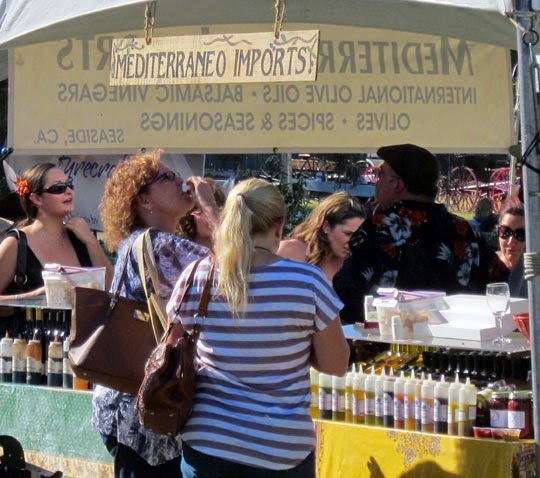 And, what's a festival without wandering around and checking out the merchants and other non-food booths. 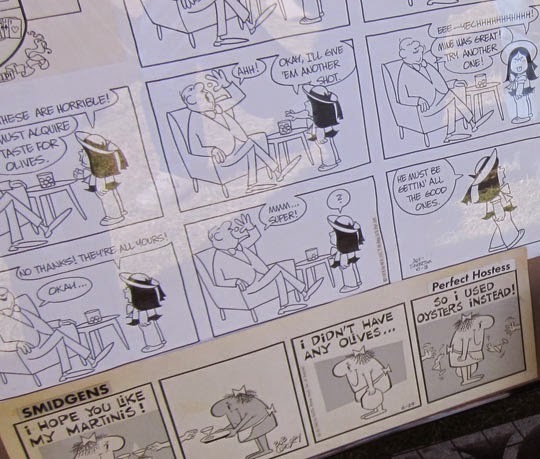 One of my favorite booths was the collection of cartoons featuring olives, including Dagwood, Emmy Lou, Beetle Bailey, and the Lockhorns. All in all a great day of hanging out with friends, bumping into more friends, and meeting new people from far and near. 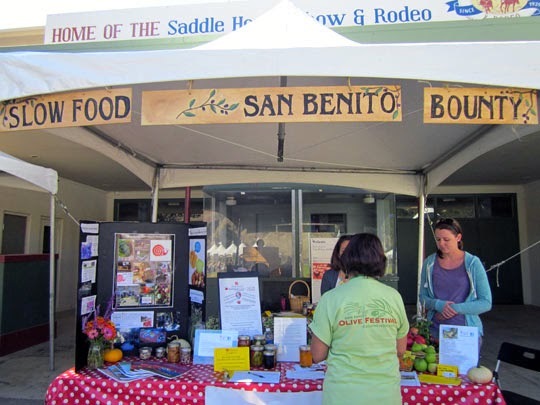 The 2014 San Benito County Fair!